During the Civil War many regular troops were withdrawn from Plains military posts to fight in the east. The Sioux, Cheyenne and Arapaho, seizing this opportunity, attempted to drive white settlers from their land.Beginning on August 7, 1864, the Indians made concerted attacks on stage stations and ranches along the Oregon Trail, hitting nearly every settlement for 400 miles from Julesburg to Big Sandy. Travel ceased for two months. The most severe attacks were along the upper Little Blue River where about 100 people were killed. Several died at Oak Grove but others escaped and Pawnee Ranch was successfully defended. At "the Narrows" the Eubanks families were attacked and seven killed. Mrs. Eubanks, two children and Miss Laura Roper were taken prisoner and held captive for months. Teamsters were killed, wagon trains burned and ranches were smashed or burned. Settlers fled east to Beatrice and Marysville or northwest to Fort Kearny on the Platte for protection. Troops and local militia companies attacked and drove back the Indians in the battle of the Little Blue on August 17, 1864. Major raids ceased but skirmishes continued through the fall. 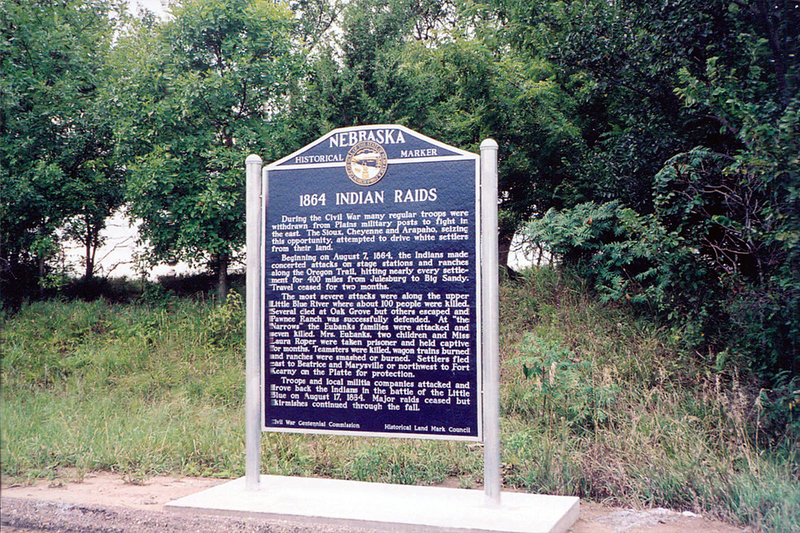 “1864 Indian Raids,” Explore Nebraska History, accessed April 19, 2019, https://mynehistory.com/items/show/378.